I had to make an instant selection at the newsstand in Heathrow airport recently, which is difficult since I’m not a huge bestseller-reader, and find most crappy mass-market thrillers or romances to be painful. (With plentiful exceptions for good genre writing.) I grabbed two, one an Elizabethan man-thriller whose name I can already not recall but was dull, gruesomely violent and I read 15 pages then left it on the plane. 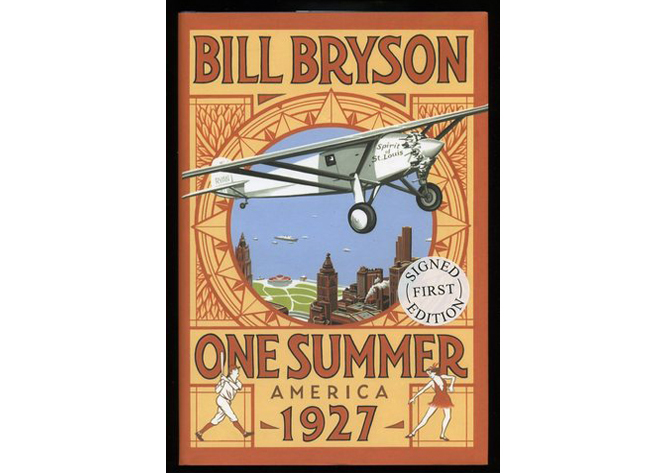 The other was this one, One Summer: America 1927, by Bill Bryson. My split-second thought process was to remember that my mom loved A Walk in the Woods, and raved about what a great author this guy was. And…. I can now agree with her: Bill Bryson is a wonderful writer with wide appeal and richly deserves his place of pride as a huge bestseller. This book, One Summer: America 1927 is a fascinating portrait of America in 1927, told through the stories of some of the great events of the time: Charles Lindbergh flying from the U.S. to Europe in the first successful transatlantic flight, Babe Ruth batting an unprecedented number of home runs (I’ve already forgotten), the invention of television. Bryson has a humorous, conversational style and is a fantastic storyteller with an excellent grip of narrative tension. I found myself pausing ever 3o pages or so to relay something interesting I was learning to my husband. Like, in the 20s the parks on Park Avenue were much wider, and lost 17 feet on either side to make room for more lanes for cars. (They shouldn’t have done it!). Or, the strange fact that before mass communication, people turned out in giant, enormous crowds for things. Like, hundreds of thousands of people would come out to watch a train carrying the president go by. The book was informative, educational, evocative of the historical period, and seemed like the kind of thing that would interest almost anyone. I couldn’t put it down until it was done, several days post plane-ride.